Few realize it today, but the Texas Revolution started at sea, and it was at sea its hard-won independence was saved by the little-known Texas Navy. On September 1, 1835, the armed merchantman San Felipe thwarted an attempted boarding by a Mexican war sloop. Aboard San Felipe were revolutionaries Stephen Austin and Don Lorenzo de Zavala. Their near escape from the Mexican navy made them realized that with Texas’ immense coastline and its reliance on maritime trade, war with Mexico would mean a war at sea. Texas needed a navy. The Texas provisional government bought a 70-ton former privateer with four to six small guns and renamed her Liberty. Next came the Invincible, a former slave trader with six short-range carronades and a nine-pound swivel gun. Brutus, a 160-tonner armed with a long 18-pounder and nine short guns, followed. The last ship in the fledgling navy was the Independence. At about 170 tons and mounting nine to 11 guns, Independence was placed in the command of Charles E. Hawkins, a former U.S. Navy lieutenant who also became the fleet’s commodore. Hawkins understood his fledgling navy was too small to fight fleet actions with its Mexican counterpart. He focused instead on commerce raiding, attacking, and capturing merchant ships carrying war supplies to Mexico. The bounty captured with this strategy proved profitable to the Texians’ land war. On her first cruise, Liberty captured the Mexican merchantmen Pelicano, carrying a cargo of gunpowder hidden within crates of flour. The powder was given to Sam Houston’s army. On April 10, 1836, Invincible boarded the American merchantman, Pocket, sailing for Matamoras. Hidden aboard was powder, shot, and food for the Mexican army. Also found were dispatches addressed to Mexican General Antonio López de Santa Anna revealing his invasion plans for Texas. Liberty, on coastal patrol, captured another U.S. merchantman smuggling war materiel to Matamoras. Houston’s victory against Santa Anna at San Jacinto in April 1836 supposedly gave Texas its independence. In fact, it simply resulted in a temporary truce. Santa Ana was not ready to give up. While the Texas fleet refitted in New Orleans, Santa Ana ordered the Mexican navy to blockade Texas ports. The result was devastating. While returning from her refit, the Independence was intercepted by the Mexican naval blockade. After a running gun battle, she was forced to lower her colors. In August, Invincible was intercepted by Mexican warships outside Galveston Bay and riddled with shot. Brutus sailed to Invincible’s aid, only to run aground on a sandbar where she was broken to pieces by the sea. With its navy sunk, Texas was vulnerable to a Mexican invasion from the sea. Fortunately for the Texans, a dispute over Mexican debts owed to France resulted in a French blockade of Mexico’s ports. What became known as the Pastry War gave Texas a chance to rebuild its fleet. President Mirabeau Lamar convinced the Texas Congress to buy nine new ships. A converted passenger side-wheeler, Zavala, carried eight guns. The 600-ton flagship Austin was armed with 20 24-pounders. Three 170-ton schooners—San Jacinto, San Bernard, and San Antonio—were each armed with six 12-pound carronades. The brigs Wharton and Archer, about 400 tons each, were armed with 15 18-pounders, plus a 12-pound long rifle on the Wharton. The tender Louisville and the receiving ship Potomac made up the rest of the fleet. A U.S. Navy lieutenant, Edwin Ward Moore, was named post captain of the Austin and commodore of the new Texas Navy. In late 1840, Moore stood out with Austin, San Antonio, and San Bernard, leaving behind both brigs for coastal duty. The steamer Zavala was laid up for repairs. The cruise went badly. On February 11, 1842, a mutiny broke out on the San Antonio. One officer was killed before the uprising was put down. Two mutineers were later hanged. Then San Antonio was lost at sea. Later, San Bernard was driven ashore by a storm. Worse was happening at home. Lamar was succeeded by Houston, assuming his second term as president. Despite his war hero reputation, Houston was both anti-army and navy. Houston convinced the Texas legislature to pass a secret act ordering the fleet sold off. Alerted to plan, Commodore Moore took Austin and Wharton to New Orleans, out of Houston’s reach. He repeatedly ignored orders to bring the ships home. 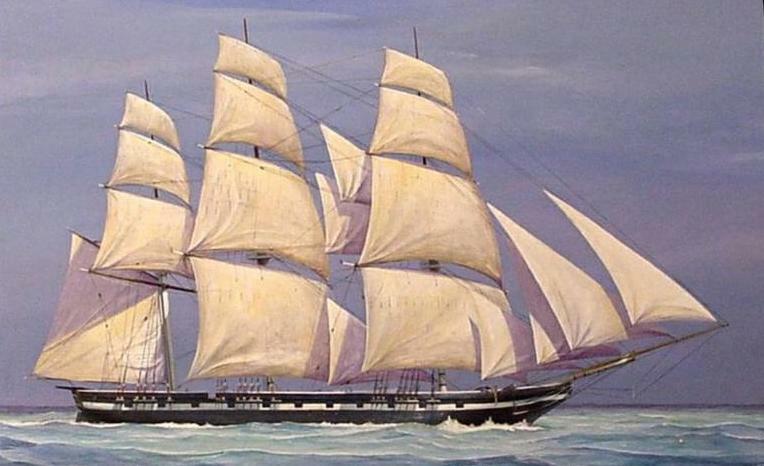 In the Spring of 1843, Moore received news the Mexican Navy had acquired three new armed steamers—Guadaloupe, Moctezuma, and Regenerador—and four smaller sailing ships. Seeing the danger posed to Texas, Moore set out with his two-ship fleet and intercepted the Mexican fleet off the coast of Campeche, a state on the Yucatán Peninsula. What ensued was one of the most incredible and least known naval battles in history. The Battle of Campeche started on the morning of April 30, 1843. Austin and Wharton sailed straight into the Mexican fleet, firing port and starboard broadsides, and driving a wedge between the steamers Guadaloupe and Moctezuma, and their escorts. With their force divided, the Mexicans broke off. The Mexicans lost 20 crewmen killed. Wharton lost two crewmen, the Austin none. Reinforced by the Regenerador, the Mexican fleet attacked Moore on May 16, with Guadaloupe and the Montezuma falling on Austin. The Texas flagship took a pounding for nearly two hours. Suddenly, Moore turned on his pursuers, sailing between them firing broadsides. The steamers staggered under the assault. Their wooden side wheels splintered and their decks became littered with dead and wounded. Again, the Mexicans broke off, but Austin pursued the enemy for 14 miles until her own battle damage forced Moore to break off. The Mexicans lost 87 killed; the Texans five. The battle showed the Mexican navy, despite better ships and armament, had no stomach for battle. The victory inspired revolutionaries in the Mexican state of Yucatan to rise in rebellion, taking Santa Anna’s attention away from his invasion plans for Texas. That summer, Mexico signed a truce with Texas. Texas joined the United States in 1845. What was left of its small fleet was turned over to the U.S. Navy, which sold them for scrap. A Really Cool Piece of Texas History!